The next exam for the Basic Adobe Proficiency Certification, offered by the Earthbuilders’ Guild, is scheduled for May 17th and 18th at New Mexico Earth Adobes in Albuquerque, NM. This exam, designed and reviewed by adobe experts, is designed to show the applicant’s skill and comprehensive knowledge in the field of adobe construction. The San Diego Adobe Heritage Association has announced that its 8th annual adobe home tour will feature adobe homes and buildings in and around Pauma Valley, California. Held on Sunday, March 24, the tour will feature buildings from the early 19th century through the 1970s; an adobe mission, an adobe church, a classic rancho-style adobe and four modern-design adobe homes demonstrate the wide variety of earthen construction in San Diego County. Tickets are $27 and can be purchased athttp://adobehometour.com. Figure above: Surface profilometry results of block one out of three. The range of deviation from flatness was about 1mm. The SBA-funded research project described in the previous newsletters has been completed as of late November 2018, and the final report was given to us in the third week of January 2019. To be clear, the report had been finalized by the Sandia Laboratories scientists/engineers almost as soon as the testing was completed, but this being a National Laboratory, the report had to pass through a rigorous security assessment to determine whether it was eligible for distribution outside of the lab. This takes some amount of time, but well worth the wait since it produces a document that has been blessed by some of the most capable security folks in the nation. The summary results of this project have exceeded our most optimistic expectations. In my last (Nov. 2018) update I mentioned that the scientists had moved forward with testing and analyzing some alternative bonding materials, acrylic epoxy to be specific. The epoxy was tested in terms of its strength, compressibility, and cure time. While the details are proprietary to our effort, what I was most surprised by was the fact (data matters!) that by using the epoxy, a small amount of ductility was introduced to the “system”, meaning when two blocks are bonded this way, when a 3-point bend test (some refer to this as the rupture test) is carried out, the bonded blocks do not catastrophically break. Rather, what was seen was that the bottom block did crack, but that the crack did not travel upwards and crack through the top block, and when the pressure was relaxed, the pieces, including the cracked bottom block, remained together as one, still bonded together, unit. I am pretty sure that this result is an exhibit of some pretty unique characteristics of using epoxy to bond SCEBs. The following graphs were produced by the SNL team. Figure above: Results of shear testing of blocks bonded with epoxy adhesives. Image (a) shows results for the unfilled epoxy formulations. Image (b) shows results for sand-filled epoxies. One particularly satisfying result of this project was to see the level of enthusiasm and engagement among the scientists/engineers at SNL that were working with us. This technology is not one that routinely comes their way and, truth be told, I think they found it refreshing to work on something that allowed them to stretch their imaginations and embrace some sustainable materials as well. The useful and somewhat surprising tests that they are able to carry out and report on are truly impressive, an example being the following image. This is not something that is normally tested, but in this case, they arrived at the conclusion that they needed to do this to understand a critical aspect of the SCEBs. We are going back to the trough, so to speak, and petition the SBA for a second round of funding to now test the in-plane shear of a built wall system with the epoxy bonding. If we can, we are also going to attempt fire rating testing as well, but that may be a stretch, given the limited funding that is available. I will continue this series if we are successful in our request. We have completed our second season in Golden, Colorado and have signed up again for our Block Production facility along Highway 93 between Golden and Boulder. A recent accomplishment along that road comes from the marketing world. We have a roadside 5’ X 10’ sign! Lisa is a traffic engineer on the side. Her information reports 18,000 cars a day. Securing the permit and getting it built was some effort, but we believe, worth it. Let’s see what happens! The Castle Rock home is up and dry. Our part is complete and a good job of it, if we don’t say so ourselves! We do have the data loggers installed in the blocks. About 65% of the funding needed was provided through “Go Fund Me”. However, we are waiting for the interior work to be complete before we will have data to share regarding heat and moisture transfer through the wall system in that home. The exterior walls are 10” thick SCEBs, with 2” of Roxul panels. The finishes are twin track wire (I really like this product) and plaster exterior and lime washed exposed blocks interior. The best for last: We are forming a cross border SCEB company with Francesco Piazzesi. Francesco is the founder of Echale A Tu Casa, a Mexico City based, social business responsible for the housing of over 1,000,000 low-income Mexicans through the construction of 35,000 SCEB homes (and counting) and 150,000 remodels. Francesco and Jim have been amigos for a couple of decades and we are honored by his trust in Colorado Earth to assist him in bringing his technology over the border. He is sending up a new line of equipment and we are challenged to build a Show Home to advance the cause of earth block walls. We intend this Show Home to start with earthen walls, however, we want every square inch of every material within the structure to first be vetted with a set of parameters including health, energy efficiency, embodied energy, LCA, comfort and affordability, to start the list. Beauty is assumed! We are seeking input from everyone and everywhere to make the judgements on each foundation / flooring system, through the faucets and lightbulbs, to the roof (solar or earth or…?). Jump in! Email lisa@coloradoearth.com or jim@coloradoearth.com with ideas! Adobe in Action proudly announces Earth USA 2019 – The 10th International Conference on Architecture & Construction with Earthen Materials. The formal conference will be taking place from Friday, October 25 to Sunday, October 27, 2019 at the Scottish Rite Center in Santa Fe, New Mexico. Earth USA 2019 indicates a wider field of interest than previous conferences and includes adobe, rammed earth, compressed earth block (CEB) and monolithic adobe (cob). Any material or method that uses clay as a binder is considered. Earth USA is now accepting abstracts for presentations at the 2019 conference. Abstracts will be accepted until Friday, February 15, 2019. All abstracts should be submitted using this online form. Complete details about Earth USA 2019, including how to become a conference sponsor, pertinent dates, and Paper subject categories can be found at https://www.earthusa.org/. The Board of Directors is accepting nominations for Honorary Lifetime Membership in TEG. Below is the Criteria. Deadline for nominations is March 1, 2019. One Honorary Lifetime Membership may be awarded to a member of the earthbuilding industry annually, with a two-thirds majority approval of the Board of Directors. Nominees should be submitted in writing to the Board by any member(s) in good standing, with a description as to why the nominee should receive this recognition, along with the material to substantiate the reasoning. The nominee should be of good character, meet TEG’s ethical standards and must meet at least two of the three criteria listed below for consideration. Submissions must be received by March 1st of the current year for consideration for this years’ award; the Board will announce its decision by the end March. This spring’s 3-day class is dedicated to Planning and Drafting for a permitted Adobe or Compressed Earth Block home, including as many Hands-on hours we can fit into the Memorial Day weekend of May 25, 26 & 27 (Sat/Sun/Mon). It will be held at our Bosque, NM country site, 38 miles south of Albuquerque. Price is the same as 2018 and the class bonus (only for registered students!) is Plan 704, sent to you in PDF form a few weeks before class. We can also send 704 to your local repro shop for copying. Visit www.adobebuilder.com for details. The class is limited to 14. TEG Members are welcome to send in articles for our next newsletter. Please contact Pat at theearthbuildersguild@gmail.com for more information. Are you interested in expanding your understanding and knowledge of building with earth? Perhaps looking for volunteer opportunities? Take a look on our website under the Members’ tab or on the Directory for more information on who, what, when and where! And keep an eye on the TEG blog for additional classes and projects going on in the earth-building world. The 3-day class is dedicated to Planning and Drafting for a permitted Adobe or Compressed Earth Block home, including as many Hands-on hours we can fit into the Memorial Day weekend of May 25, 26 & 27 (Sat/Sun/Mon). It will be held at our Bosque, NM country site, 38 miles south of Albuquerque. Price is the same as 2018 and the class bonus (only for registered students!) is Plan 704, sent to you in PDF form a few weeks before class. We can also send 704 to your local repro shop for copying. Visit www.adobebuilder.com for details*. The class is limited to 14. TEG is excited to announce the next TEG Tour. We will be meeting in Hillsboro, New Mexico at 9:30 a.m. on Saturday, November 10th. We will meet at the Cafe. The tour will cover the Black Range Museum (building from c. 1884 with iconic round adobe water tower build late 1920s), the ruins of the Sierra County courthouse (build 1892) and jail, and historic homes along Main and Elenora streets. We will spend a couple of hours taking in as much as possible. We will have lunch beginning at noon at a local restaurant. (no host/RSVP required). The tour is free. Local resident, Garland Bills will be our guide along with one or two other locals. Take a look at the Hillsboro website for a feel for the historic town. The TEG Board meeting will be held after lunch at the Community Center. Guests are welcome. Please RSVP to Pat ASAP at 575-644-8099. It is with great sadness that we of New Mexico Earth Adobes announce the passing of Richard Levine, patriarch of the Albuquerque Levine clan and proprietor of NM Earth Adobes. Richard founded New Mexico Earth Industries in 1972, and his company remains one of the largest suppliers of adobes in the US. Although Richard retired several years ago from active participation in the adobe yard, we will miss his advice, his support, and his humor! Richard leaves behind his wife, Clara Speer; his sisters, Ruth and Anne; his seven children, Keith, Helen, Mark, Ben, Leroy, David, Halcyon, and his step-son, John Bear; eight grandchildren, one great-grandchild, and a huge circle of friends. Richard was a talented photographer, geologist, and librarian; spoke fluent Spanish; enjoyed poker nights with his friends; and loved to travel. He was a lover of good coffee, literature, photography, hard work, intellectual discussion, and a good laugh. He had a twinkle in his steel blue eyes and a rapier sharp wit that won’t be soon forgotten. The work is just one part of an ongoing larger CRI initiative that will propose the addition of a Cob Appendix to the International Residential Code early next year. While the work is currently under way, additional funding is necessary to meet the $6,000 thermal test budget. Donations to support the Thermal Test and CRI / IRC Cob Appendix Project can be made at https://www.cobcode.org/donate.html. CRI is a 501(c)3 non-profit organization dedicated to making cob construction legally available to everyone who wishes to build with it. The SBA-funded research project described in the previous newsletters has almost come to the end. 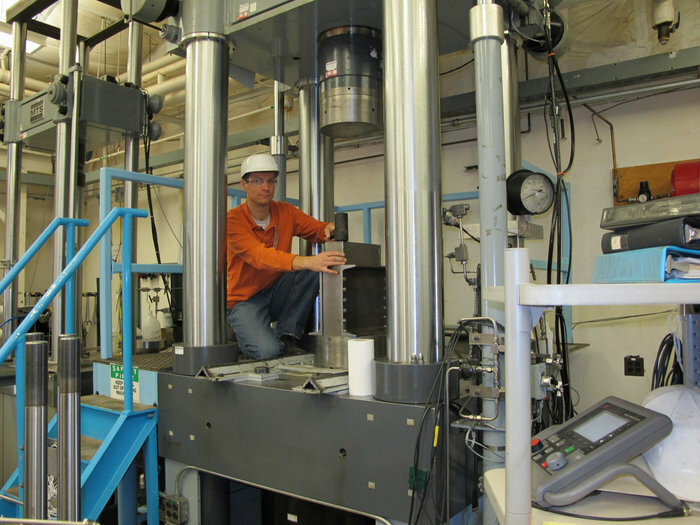 Over the last two months there have been some interesting developments, including some of the first data coming in from the shear testing of the polyurethane adhesives. The data is informative in that it does demonstrate that the use of adhesives delivers a relatively strong shear strength, which will be reported on in the next newsletter article. The images show how the Labs took the bonded pieces, cut them to a specific size (2.2 inches square) and then potted them in a super strong ceramic material that held the SCEB pieces solidly while shear force was applied in opposite directions. The resulting failure is evident with the major failure being the adhesive with some fracturing of the SCEB on the edge. This was the expected result, so additional testing will determine what the average shear strength of the adhesive is. There are upwards of 35 tests of this type that are being performed as part of this project so we are hoping that a clear understanding of the interaction between the SCEBs and the adhesive becomes evident. Another development in this project is that the Labs brought in a very specific expert in epoxy resins to discuss and suggest the use of epoxies for the adhesion of the SCEBs. At this point there are some preliminary tests being done, and we are excited to see what is found regarding their use. This will be reported on in the next newsletter as well. Overall, it has been an entirely worthwhile effort and demonstrates the effective use of this type of research funding. We’ve been busy on several fronts, fulfilling block orders, working with clients on the design of their home, and working towards setting up a second block plant on the Western Slope of Colorado. We are also excited to update you on our energy testing that will be carried out on one of our current build projects in Castle Rock, Colorado, south of Denver. Thank you for TEG and all our supporters for helping to make this testing possible. We are excited to share that the data loggers are in the wall for data collection! We will start collecting data for the next year on how the wall performs with regards to moisture and heat transfer. We are working with Emu Systems and SMT Research on this project. The image above shows the Rockwool insulation going over the CEB walls. To learn more about this study please visit GoFundMe. Joe Tibbets is headed to Honduras and Roatan island to work with Rodrigo Flores Gomez, an old friend from USAID days. Rodrigo has a Belgian hand press (one at a time) CEB machine, with which he and crew have made many thousands of stabilized CEBS on mainland Honduras. The island has great soils for adobe, so we are going to see what might be done. The island now has a wind farm and is trying to enhance its environmental protections. As you probably know, Roatan and the Bay Islands have the second largest coral reef in the world, only second to the Great Barrier Reef of Australia. To protect the reef, they have to prevent off-flow from the shores of the island and so interest in things “green” is enhanced there. Of course, we’ll have plenty of help from the Iguanas, lots of screeching from the parrots and hopefully not much help from the Crocs…. (ha ha). TEG Members are welcome to send in articles for our next newsletter. Please contact Pat at teg@theearthbuildersguild.com for more information. Taos pueblo was constructed in a setting backed by the Taos Mountains of the Sangre de Cristo Range. The settlement was built on both sides of Rio Pueblo de Taos, also called Rio Pueblo and Red Willow Creek, a small stream that flows through the middle of the pueblo compound and is their water source. Its headwaters come from the nearby mountains. Taos Pueblo’s most prominent architectural feature is a multi-storied residential complex of adobe – built probably between 1000 and 1450 CE, according to the Pueblo’s website Inhabited for hundreds of years there is still no electricity, running water or other utilities. The Pueblo is the essence of adobe construction. It was designated a National Historic Landmark on October 9, 1960. In 1992 it was designated as a UNESCO Heritage Site. For a complete description of the Pueblo visit their website: taospueblo.com And if you have not been there be sure to put it on your bucket list. It is rich in culture and a true example of adobe construction. Be sure to keep an eye out for TEG’s Tours which are announced on our Websitetheearthbuildersguild.com In September we will be in northern New Mexico and in November we will be in Hillsboro/Kingston, NM (southern New Mexico). We all know that a properly built earthen home is comfortable – after all it’s been done for thousands of years. Now the energy efficiency of homes built with earth can be compared to just about any other material with a tested R-value and the results reflect what has been known since prehistoric times. The accepted standard is a HERS (Home Energy Rating System) rating, which compares the rated home with the same home built to 2006 IECC standards. One big advantage for earthen homes is the ability for the mass walls to absorb heat (or coolness) and redistribute that into the adjoining interior space when the outside temperature changes. A properly oriented building using passive solar design takes full advantage of shifts in seasonal solar gains, but when that’s not possible or desirable because of views, lot design, etc., the benefits of mass walls are still evident in the rating. The SBA-funded research project described in the previous newsletter (May, 2018) continues to move forward with some interesting results, some good, some bad. One unanticipated situation is that the scientists/engineers at Sandia National Laboratory (SNL) and the company researching the adhesives hopefully suitable for bonding compressed earth blocks (CEB’s) both desire to test for baseline results, while I desire to get real-world use results since that will determine whether we commercially pursue any solutions found. This was an unanticipated condition in that we may not be able to determine my desired results before exhausting the research funds. Still, I had to ultimately agree with the more knowledgeable and experienced team members since understanding the fundamental concepts and data points will provide a more justifiable basis for moving things forward than a one-off solution that could be too fickle to be easily tweaked for broader uses. So, we are proceeding with testing of bonding agents that include varying compositions of adhesive as well as varying thicknesses of the bond line. As the testing progresses, we expect to have results that will serve to demonstrate the utility of bonding the SCEBs together. We are hoping to have shareable results somewhere in the late fall time frame so stay tuned! Adobe in Action Co-Director and TEG Board Member Kurt Gardella attended a 4-day turf house construction workshop in Iceland in May 2018. The workshop took place in the Northwest of Iceland in the area of Tyrfingsstaðir, Skagafjörður. The course instructor – Helgi Sigurðsson of Fornverk ehf – guided the group through the reconstruction of a stone foundation and turf walls of a typical Icelandic sheep farm building. The course was organized by BYGGÐASAFN SKAGFIRÐINGA – Regional Folk Museum. Each morning began with the group walking to a lower area of the farm to cut turf blocks from a wet field using sharpened shovels and a special undercutting spade. Turf blocks can be cut in a variety of shapes and sizes but we cut clamped blocks which are fairly large and triangular in shape. While in the field we also cut strips and turfs using a turf scythe. These thinner and longer pieces are laid longwise or crosswise between the courses of turf blocks in order to tie the blocks together (similar to mud mortar in adobe construction). The wall construction techniques we learned focused on double-wall turf block construction with a special focus on dry-stacked stone foundations. A sound stone foundation is the starting point of any quality turf wall in Iceland due to the wet climate. We ended the workshop by constructing a simple gable roof frame out of recycled timbers. This frame was finished with a layer of turf strip “shingles”. Further layers of turf strips will be added by a future workshop group. Kurt Gardella wishes to thank the workshop organizers and instructors in Iceland for their hospitality (traditional lamb meals) and patience (English translations of all topics covered). He also wishes to thank the Santa Fe Community College Adobe Program for covering his workshop fee. More information about Icelandic turf houses can be found athttps://en.wikipedia.org/wiki/Icelandic_turf_house. More information about the New Mexican method of building with turf/sod blocks (terron) can be found at https://en.wikipedia.org/wiki/Earth_structure#Sod_or_turf. Reference: “Building with Turf” by Sigríður Sigurðardóttir. English version by Nancy Marie Brown. This book can be downloaded as a PDF here. The Earthbuilders’ Guild offers a Basic Adobe Proficiency Certification, comprised of a written exam and a hand’s on practicum. These exams, designed and reviewed by adobe experts, are designed to show the applicant’s skill and comprehensive knowledge in the field of adobe construction. Over many years the Adobe Alliance has held workshops a few miles outside of Presidio, Texas, constructing a beautiful adobe compound of soaring vaults and domes. In creating the various structures of the Swan House, Simone Swan, TEG member and the principal of the Adobe Alliance, was strongly influenced by the technique and style of architect Hassan Fathy, with whom she apprenticed in the 1970’s. Due to passing time, weather, and the nature of the materials used—unamended adobe and earthen plasters—a few of the domes require restoration and the application of lime plasters to further protect them. Work on the Swan House is scheduled to begin on October 1st. For those interested in participating, please see TEG blog for more information. Update from Colorado Earth – Energy Performance Testing and We are Hiring! Housing is a major public health issue. The United Nations once estimated that 10 million people worldwide die each year from conditions related to substandard housing. Our Team intends to address this construction issue by validating a durable, economically and environmentally sustainable wall system that can be utilized in greater capacity today. Earthen walls have proven themselves capable, having already provided safe and comfortable shelter for thousands of years. These homes, when properly built for the climate and environmental hazards, address the need to manage moisture risk and conserve energy consumption, while minimizing maintenance requirements and life cycle costs. The Smithsonian Magazine recently celebrated their 40th anniversary and to commemorate the event, shared 40 things you need to know about the next 40 years. Number one on their list of “major changes” was that “sophisticated buildings will be made of mud.” Despite the fact that earthen construction has been in constant use for over 10,000 years, modern building materials and industries have led the front for testing and building science advancements. There exists a lack of adequate empirical confirmation that substantiates what has been shared anecdotally for thousands of years – earthen homes keep people warm in the winter, and cool in the summer. For our testing purposes, Stabilized Compressed Earth Blocks (SCEB) will be used to research how moisture and heat transfer through an earthen block home that will be built this summer in Castle Rock, Colorado, USA. In parallel with the testing, our Team will develop a calibrated model of the thermal performance of earthen construction that will be used as a test bed for vetting design solutions. We hope you can help us obtain this useful data by supporting us to obtain the necessary sensors and equipment to install in the wall. Our Team will monitor heat and moisture changes within the wall and on the interior surface of the exterior wall over the course of a year, and then work to improve the energy efficiency software programs. Unlike many products today, the price of soil is not tied to the price of oil. Stabilized earthen walls are impervious to water damage, fire-proof, insect-proof, bullet-proof, and can be built with minimal training. Additionally earthen walls have the unique ability to absorb and adsorb water vapor, unlike traditional wall systems. Our Team is ready and willing to learn more through applied research, and share this knowledge with the construction industry for the betterment of our environment, health, and economy. Our mission will be to disseminate the performance of earthen wall systems so that energy savings can be realized worldwide. We hope you help us! Click here to visit our GoFundMe site. Also we have some exciting upcoming projects in Colorado Earth and are looking for help! Please contact lisa@coloradoearth.com or jim@coloradoearth.com for more information. Send your resume! Our 3-day Fall class has been posted at www.adobebuilder.com – it will take place Oct 19, 20, 21, 2018 (Friday-Saturday-Sunday) at Bosque, NM. Emphasis will be on Passive Solar Design, Drafting and Hands-on. There are 7 places left as of August 18. It’s a rustic, countryside class for laying adobe, pressed earth block and testing your own dirt in Adobe International’s pressing machine. Visit adobebuilder.comand note the vertical line of brown buttons on left side of your screen. Pick the 4th one down from top and click on “class descriptions”. Scroll on down the page for details (registration at bottom. Olivia Garcia the daughter of David Garcia, from Arizona lays the beginning of the ninth course of adobes on her 9th birthday as part of the Hogan Adobe build on the Navajo Nation north of Winslow on David Johns site. The adobes were ordered from New Mexico Earth and Kirk Higbee a Board member from Adobe in Action consulted on this project. Mike Lopach, also a Board Member of Adobe in Action, volunteered this weekend, July 8, 2018 building the Adobe Hogan. May is a terrific time to gather outdoors for a barbecue with friends and associates from the earth building community. Not too windy, not too rainy, neither too hot nor too chilly—usually—no guarantees though, this is New Mexico we are talking about! Experience has shown earth builders never lack for things to talk about; topics are as endless and varied as there are opinions on the best way to build, well, anything! 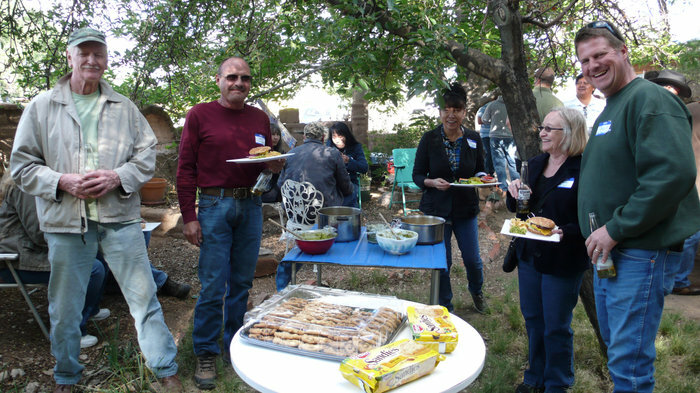 The Earthbuilders’ Guild is putting it to the test again for our 2018 Spring Social, on Saturday May 12th at New Mexico Earth Adobes in Albuquerque, 310 El Pueblo Rd. NE. Burgers-both beef and veggie, beer, and good conversation! Please join us from 4pm to 7pm for what will be an interesting and enjoyable afternoon. RSVP to he_levine@msn.com, or 505-898-1271, no later than Tuesday May 8th. We look forward to seeing everyone! 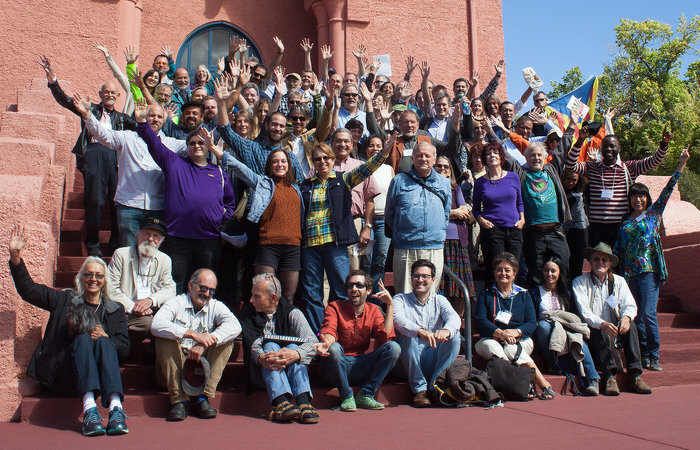 The next conference – Earth USA 2019 – is being planned for October 18 to 20, 2019 in Santa Fe, New Mexico. The call for abstracts will be opening in August 2018. More information can be found at www.earthusa.org. While adobe construction is often associated with the inland Southwest areas of New Mexico and Arizona, adobe enthusiasts might be surprised to learn that entire neighborhoods of adobe homes were built in San Diego County, California in the decades after World War II. Every spring for the last seven years, the San Diego Adobe Heritage Association has conducted tours showing the full range of these residences, from 19thcentury ranchos to astonishing (and relatively recent) adobe mansions. Responding to increased housing demand after the war, entire adobe neighborhoods were built by developer/builders in the areas around Escondido. The most famous and prolific of these adobe builders were the Weir Brothers, whose ranch homes combined traditional rancho elements such as wagon wheels with contemporary contemporary open planning that was becoming popular in Southern California. 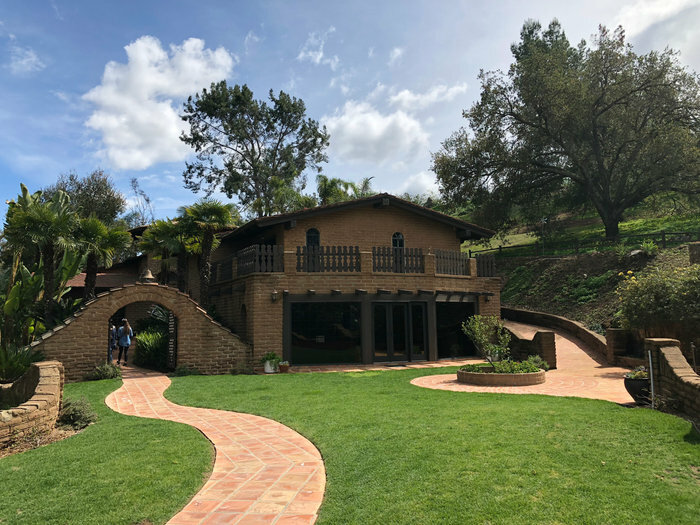 This year’s tour featured five houses constructed between 1951 and 1980 when the remarkable two story Muchow adobe was built by George Patterson. Patterson, who held court in the adobe’s sitting room, built some twenty adobes homes, and witnessed both the boom and in adobe construction in California to its decline in the 1980s. And while changing building regulation was responsible for the exit of the industry, it was not seismic issues that were the cause – Patterson remarked that it was actually prescriptive insulation requirements (later reformed) in early versions of California’s energy code that effectively ended adobe construction in the area. The SDAHA has already begun planning next year’s tour, which will be held on March 24, 2019 and will feature homes in Pauma Valley. See adobehometour.com for additional information and details. Jim has been working to bring SCEB technology to Haiti with Mike Neumann and Partners in Progress of Pittsburgh since 2009. The citizens of Deslandes were presented with options for their new school buildings and the first one was built of Stabilized Compressed Earth Blocks in 2009 to 2010. It was constructed with local labor and with local materials. 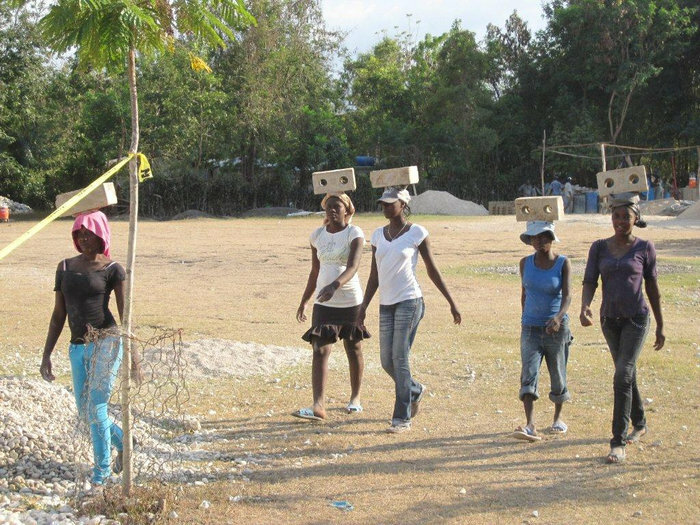 Nearly all building materials in Haiti are imported, making them very expensive in the poorest country in the Western Hemisphere. Training courses were provided. The first class had nine students, the third had 54, and as a result, significant employment has been provided. Three school buildings have been completed and our trained crew is now building houses for those who need them in Deslandes. We are excited to be taking on another classroom building in Savanette Cabral, down from the mountain towards the sea. It has been our goal to provide a traveling crew to go with our donated Ital Mexicana machine (thank you, Francesco!) to other parts of the island. This is the year! “Saving the Southwest Vernacular” was the title of TEG member Anne Galer’s presentation to the Alliance for Historic Landscape Preservation at its annual conference in Tucson in March. The AHLP is an association of architecture and cultural landscape preservation professionals from the US and Canada. Anne’s presentation discussed how the current national and international preservation systems — such as the National Register of Historic Places — exclude everyday vernacular buildings from the protections they provide. She offered examples (some from TEG members) of how local jurisdictions and individuals are working to save old adobe homes, village stores and other parts of our Southwest landscapes. Colorado Earth is a new facility located at the foothills of the Rocky Mountains in Golden, Colorado. We launched in May 2018 and haven’t been bored since. We are excited to share our plans for this summer… a couple of scheduled workshops, a 3000 sqft home to build in Castle Rock, and more adobes and earth blocks to make this coming season! 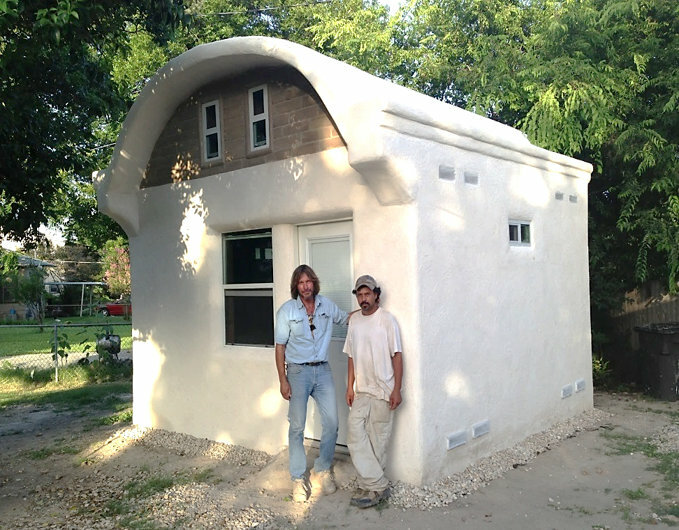 Our workshop scheduled in Golden, Colorado will be a unique opportunity to be part of the construction of a small structure from foundation to finish plaster, including a barrel vault for the roof. Come visit Jim and Lisa in action in Golden, we’d love to see you there. I have come to believe that looking for answers to questions such as I faced when I started down this dirty path is not for the faint of heart. Earthen material is both wonderful and, at times, maddeningly elusive in terms of simple solutions. A little too much hydration and you get block extrusion, a bit too long in the hopper and the mix won’t flow correctly, too much round aggregate and you get poor material distribution, too little pressure on the ramming stroke and you get poor edges, and on and on and on. If you think outside the blocks, you can start to answer these questions using available resources that may not be immediately apparent if you stay within your comfort zone. Get in touch with the Small Business Administration (SBA, where we are currently the recipient of a $30K grant to once again get technical assistance from SNL for a potentially game changing mode of block bonding), the MEP, your local Universities, and other organizations whose mission is to help you solve your particular problems. Once you think outside the blocks, you can begin to see the manufacturing world from the very heart of these same blocks! 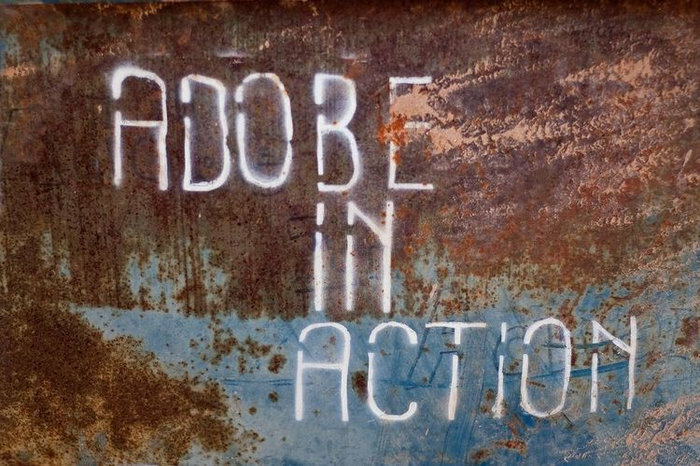 For 2018 Adobe in Action is supporting two different owner builder projects – one in the Silver City, NM area and one in Abiquiu, NM. The Silver City owner builders are putting the finishing touches on their adobe walls and getting ready to install a wooden bond beam. Together we have developed a new adobe wall to bond beam attachment method where geotextile straps are embedded in the mortar joint and wrapped up and over the wooden bond beam and fastened tight. Keep an eye on the owner’s project blog for some photos documenting this technique very soon. 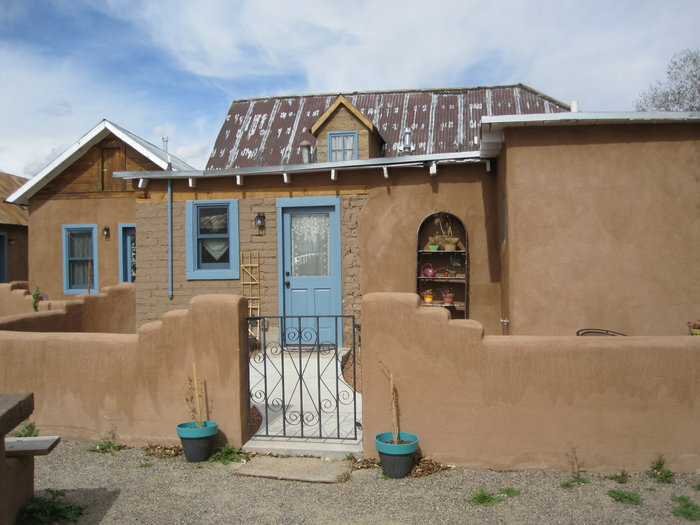 For the Abiquiu project we are currently helping the owner with his building plans (via our online project consultation system) and hope to have a permit in place for breaking ground on the foundation in June. Visit our website for more information on getting your own adobe project supported by Adobe in Action. Our 2018 online course sequence is in full swing. Six students are working their way through the current History & Basics of Adobe Construction course – collecting and testing soils and getting ready to make some first adobe test bricks. The next course in the sequence – Foundations for Adobe Structures – will be starting on May 14th. In other education news, check out our new podcast series called Mud Talks. In the series, Board President Quentin Wilson talks about the power of adobe as a building material and guides you through the process of building your own adobe home. You can listen and subscribe to the podcast here. In conjunction with our bi-monthly Board Meetings we arrange a tour of a local site. It can be a private home, a historical property, a construction sight….any earthen property of interest to TEG board members, members and guests. The tour on March 24th took us to a private home in Corrales, New Mexico constructed of rammed earth. The architect, Efthimios Maniatis was our host. 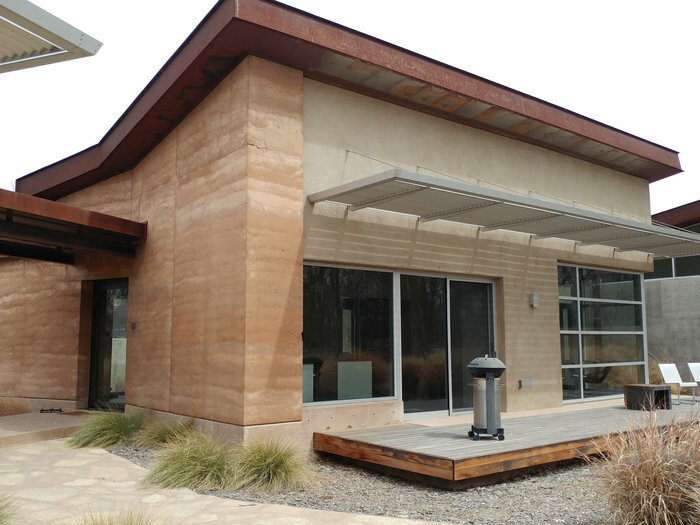 TEG member, Mike Sims was the rammed earth contractor on the home. 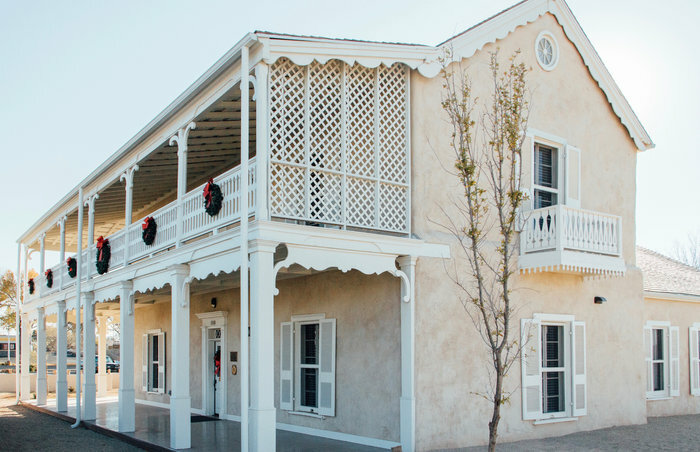 The grand and iconic two-story adobe Nestor Armijo House* in Las Cruces, New Mexico has been undergoing careful stabilization and rehabilitation for several years as a part of a collaborative community process. The original home was built between 1865 and 1867. The project has revealed new information about the history and building chronology of the house. Saving the building has required state of the art adobe stabilization techniques and innovative engineering solutions, along with application of traditional materials. Preservation contractor and TEG Member, Pat Taylor in consultation with project engineers Fred Webster and Sonya Cooper sought to stabilize and support the structure in place, using established basal wall stabilization best practices and careful adobe wall reconstruction. Concrete was carefully removed from around the building as stabilization progressed, including sidewalks, concrete collars, and concrete patches. Cement plaster and elastomeric coatings were also removed, and were replaced with permeable mud and lime renders. Original materials were used throughout, including unstabilized adobes, mud plaster, and lime plaster. It is home to the Las Cruces Chamber of Commerce. Visitors are welcome during Chamber hours. Adobe in Action came through again! Earth USA 2017 lived up to its name. Countries from around the world and the US were represented in presenting curren work, studies, and projects, all earthen related!